This season, while cheering on the Tigers at Comerica Park, don’t be surprised if you find yourself waiting for a coney dog pizza next to Leon Phelps, also known as “The Ladies Man” from Saturday Night Live. Or perhaps you’ll recognize him for one of the many other gut-busting personas he took on at the storied sketch show — like O.J. Simpson, Tiger Woods, and Oprah Winfrey. 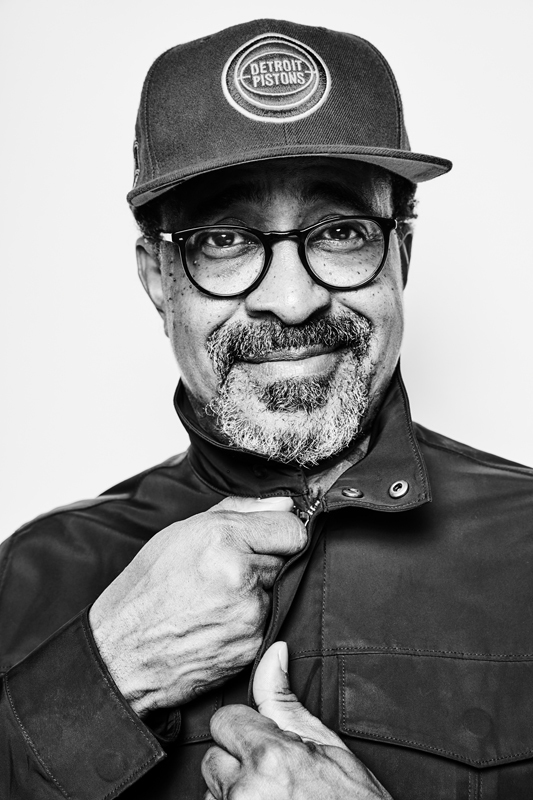 Then again, you could just recognize him as Tim Meadows, the Detroit native turned Hollywood megastar who has spent the past 25 years building a career that includes a decade at SNL, appearances in many hit sitcoms, and memorable roles in movies like The Ladies Man and Mean Girls. 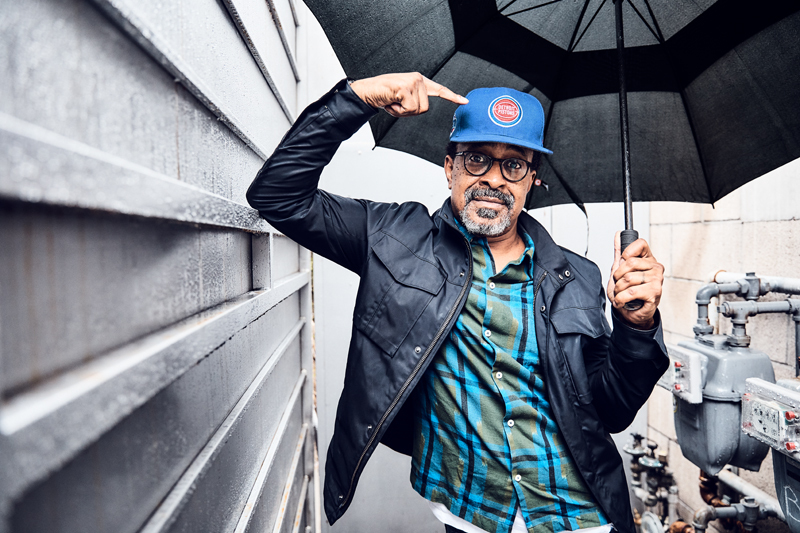 And while all this work has kept him largely planted in Los Angeles, where he’s currently starring in two situation comedies, this Detroiter is adamant about staying connected to his roots. The son of Lathon Meadows, a janitor, and Mardell, a nurse’s assistant, Tim moved into Detroit’s Conant Gardens with his family as a youngster. He attended Mason Elementary, Farwell Junior High, and Pershing High, before heading to Wayne State University to study radio-TV broadcasting and later joining an improvisational comedy troupe at the gone-but-not-forgotten Soup Kitchen Saloon. 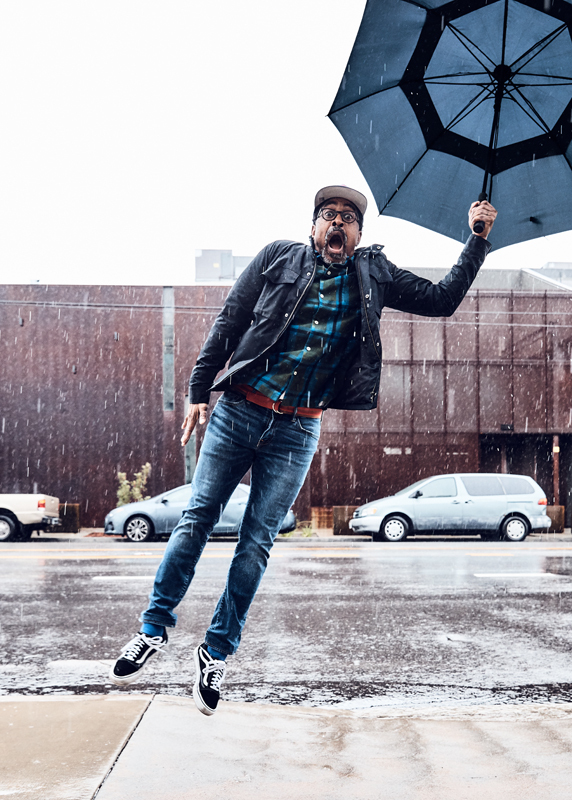 After just two years at Wayne State, Meadows dropped out and eventually moved to Chicago, where he joined the famed improv troupe, The Second City. And though it was his time in Chicago that eventually led him to be discovered by the team at SNL, Meadows believes it’s his Detroit DNA that has allowed him to maintain longevity in Hollywood. Good thing, given his workload at the moment. In No Activity, the first original comedy picked up by the video streaming service CBS All Access in 2017 and now in its second season, Meadows plays Detective Tolbeck, a low-on-the-pecking-order cop forced to spend countless hours on a stakeout in a squad car with his partner (played by Patrick Brammall, co-creator of the Australian series upon which the show is based). The eccentric comedy boasts an astonishing cast including dispatcher Amy Sedaris and guests like comedian Will Ferrell (who is also an executive producer of the show), Academy Award winner and fellow Detroiter J.K. Simmons, Bob Odenkirk, and Jessica Alba. Meadows, also a frequent guest on the syndicated daytime game show Funny You Should Ask, has recently been seen on the ABC sitcom Schooled, which premiered this past January and is a spinoff of the network’s stalwart hit The Goldbergs. In Schooled, his character John Glascott has been promoted from a guidance counselor to the principal of William Penn Academy, the school the Goldberg offspring attended. “We shot 13 episodes, and I think the show went well,” Meadows says. (When this issue went to press, ABC had not yet announced whether it would renew the series.) Of course, playing a principal isn’t exactly new territory for Meadows — many fans remember him as Principal Ron Duvall in 2004’s Mean Girls, written by fellow SNL alum Tina Fey. I don’t know if I’ll ever not be asked about Leon Phelps. But I don’t care. It was a blast to do. The 10 seasons Meadows, 58, spent on Saturday Night Live made him one of the longest cast members the show has ever had — in fact, only a few others, like Darrell Hammond, Fred Armisen, and current ensemble member Kenan Thompson have surpassed it. The years he spent on the show and the bonds he was able to nurture have clearly benefited his career. After all, the SNL alumni are known to be a loyal fraternity: witness the involvement of Fey and Farrell in his career. But that doesn’t mean Meadows hasn’t faced his share of letdowns. The Michael Richards Show, arriving on the heels of Richards’ sky-high popularity from Seinfeld, and the animated/live-action mashup Son of Zorn (which featured SNL alum Jason Sudeikis) showed great promise but never quite caught on with audiences. His role as a next-door neighbor on The Bill Engvall Show lasted a few seasons, then disappeared. Another thing that’s still with him after all these years: Leon Phelps, the oversexed radio talk show host that originated on SNL and spun off into the big-screen comedy The Ladies Man. Now that he’ll be around the city on a more regular basis, Meadows is eager to create new memories. “One thing I’d like to do is perform a standup show at Third Man Records and record it,” he reveals. “I love going there when I’m in town. And I’m hoping to go to more Red Wings games, see some local bands, and check out the music scene in Detroit. I’d also like to teach some improv classes with the Detroit Creativity Project, my friend [comedian] Marc Evan Jackson’s program [that teaches] improv to students in the Detroit Public Schools system.” It is this desire to spend his time off enjoying Detroit — the hometown that shaped him — and give back in any way he can is exactly what makes Meadows such a grounded, standout star. One of the original seven cast members on SNL, Radner is known for her characters Roseanne Roseannadanna and Emily Litella. A cast member from ’90-’96, the Rules of Engagement actor lived in metro Detroit until he was 4 years old. While serving as host in ’95, the actor and comedian appeared on Tim Meadow’s “Perspectives with Lionel Osbourne” sketch. Tomlin, who got her start at stand-up comedy clubs in Detroit, hosted SNL twice in the ’70s and once in the early ’80s. Coulier was supposed to be on SNL until executives decided he was too similar to Dana Carvey.